Wow that was a amazing show! I find it very special the people who wrote in there Yes favorite shows It really is a family of people who listen to Yes and its just amazing to me that all these years that I have listened the wide array of choices that we have as a Yes fan.I believe there is no greater rock/ pop/Prog band that can actually say they have a very diverse line of music all from one band. Having grown up in Motown and with the AM and then FM and then the quad sound that Yes is the only band that when you think about it has seen all things in music and to be still performing with the same energy level is just mind blowing.Look at the Rolling Stones I mean they are like the living dead and I don’t mean that in a bad way at all. How ironic it was for me to hear you read off the selections was truly a joy to me and it does matter to me that people know just how great this band was is and will always be regardless of the Rock and Roll Hall.Again Kevin thanks for all your hard work you make it seem so easy and I know that you pour your hear and soul into this podcast every week! Thanks so much for the kind words, Paul. I really enjoyed putting the show together and it does indeed show the family of Yes fans and their dedication to the cause! I agree that the hall of fame thing really doesn’t matter but it might just help spread the word about the greatest prog rock band of all time – and that’s what I’m trying to do, after all! 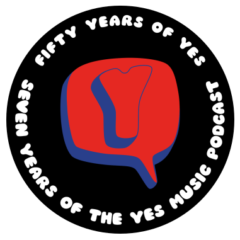 A GREAT podcast episode and a great range of music expressed there through videos from 1969 to this year. I think if I had seen NON,NEN in 69 when I was 7 I may have put down my lego, airfix models and etch-a-sketch and picked up a bass guitar. Unbelievable playing by all of them on this track, especially Chris but also did you notice we never really see Bill Bruford. He is pretty much hidden behind a sea of cymbals and other band members apart from a couple of glimpses of his chin early on, was he very shy or maybe he didn’t want to be distracted? Incidentally at the end the MTV video credits the track as “No Experience Necessary – MTV Closet Classics”. I love pieces from all of the different eras of Yes and to recall a theme of yours Kevin that ran through the album reviews, if you want to show someone why you believe Yes is so great, just point them towards this set of 16 songs in performance spanning 43 years. An Affirmative Collection. Many thanks for the kind words and your comment, Paul. It’s funny you should say that about the Yes justification…just listen to episode 55!